As our launch date is getting closer, I’d like to take the opportunity in our next series of posts, to go more in depth into some of the different views and varying ways to present information that is available with Gist. The first view I’d like to discuss, whose strength could be easily over-looked, is what we refer to as the Item Detail. Since your visualization begins as a spreadsheet, or a collected set of data, each row represents an individual item. Most of the views in Gist massage that data and represent it as a collective via a graphical view, but we can also display the detail of each item for reference, more information or to complete a more detailed picture. For example, in the “Current U.S. Legislators” Visualization, by clicking on any legislator, you can see the details for each senator or congressperson - including their website; age; gender; party; contact information; Facebook, Twitter, YouTube, CSPAN and a host of other IDs. While we use party, gender, age, etc. to create Gist's graphic views, we can utilize the same platform to make the details readily accessible for quick access and retrievable. In our “Rolling Stone Top 500 Albums” Visualization, when you click on “Sgt. 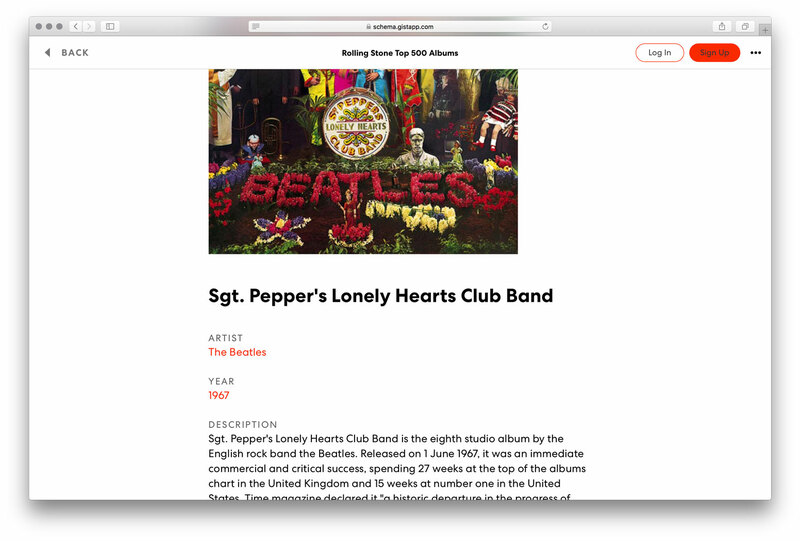 Pepper’s Lonely Hearts Club Band” you’ll quickly see it’s ranked #1, by the Beatles from 1967, of the Rock genre and a full description of the album. 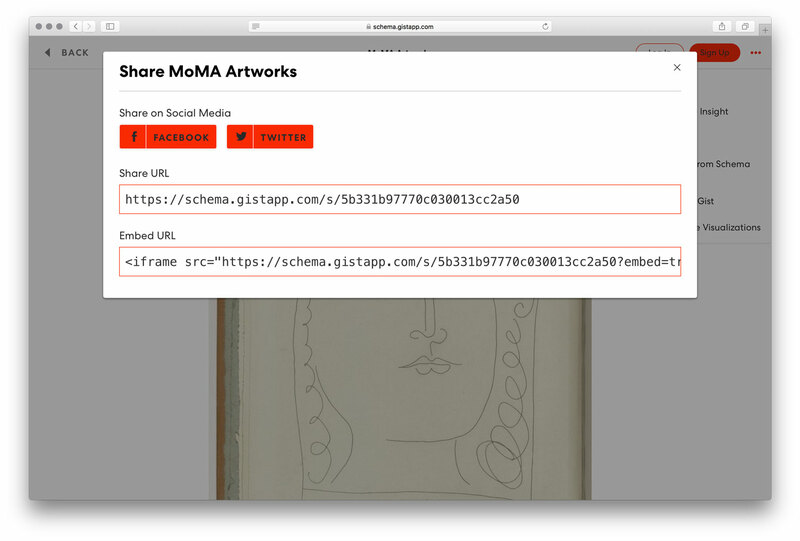 Select any piece from the “MoMA Artworks” gallery, and you can see the artist, genre, date, when it was acquired, medium and more. These additional details can give more context and texture to your overall data. Then, all that’s required to make the information available, is use the Share button (right in the Gist header) to let you instantly share you Gallery (or any other view) via Facebook, Twitter, or a URL to post directly or embed in your website. In addition to having the ability to view the detail information, Gist can display only the pieces of data you want in the detail view, and hide anything that doesn’t make sense to display. For example, with the legislators, there is a field “On Facebook: Yes or No”. The Facebook name is displayed, but Yes or No field is hidden from view, and used only to create the charts that let us analyze the information. On the other hand, if the item details provide no useful information and it’s all about the cumulative information, Gist's detail views can be turned off to keep the website clean and display only what helps to tell your story. There are a couple of great examples of this on our website, the “Visitor Motivation Survey” and “Google and AIGA Design Census” Visualizations, both of which are surveys. The information of interest in these Visualizations is all about the aggregates and the pictures they create, not the individual item (survey respondent) results, so the details are hidden from view. As always, I welcome you to explore our numerous visualizations on our Showcase, and begin to imagine different ways Gist can help you visualize and display your information.